There's lots of things that I could write about this week, but today I'm putting up another little note about blog hopping. A big thank-you to Sharon over at Beck Valley Books with her Wednesday blog-hop, which I've done a few times since starting self-publishing. One of the reasons is that when I'm going through the blog-hop links on Sharon's site, about 50 percent of the time I'll land on a page whose leading post isn't about the blog hop, and it can feel a bit awkward, as sometimes I don't feel it's relevant to post a "Hi, I'm your newest follower!" comment on a completely unrelated post. That said, I've seen some lovely, fun and inspiring leading posts in my explorations today - thanks to the Nelsens (Heather & Matt), and Dawn for making my "best of" list this morning! Anyway, whenever I do the Wednesday Blog Hop, I plan to try to put up a page like this, which while not strictly focused on the subject, ties in to some extent, and offers new viewers a friendly "landing site" to start their commentary from. So, for those who are writers, or are interested in this writer's thought process, why blog hop? Like other forms of promotion, it is an expenditure of time, time that is not spent writing or doing other things, which begs the question, is it worth it? As one of my goals in the course of releasing my latest short stories, and several more in future months is to discover the best (and worst) things a self-publishing short story author can do, (so that I can write a how-to guide on successfully self-publishing short fiction in the e-book era) it's a reasonable question to consider, since few of us are full-time writers, and time is our most limited and valuable possession. You may win a monetary lottery, but you will never be granted an extra million days to live. So far, my answer is, yes. I have made a few virtual friends so far, and expect that I will make many more. I have gotten a really amazingly insightful review from Mel at The Reading Life that allowed me to engage with his readers and inspired me to read Ibuse Masuji's "Black Rain" - an account of life after the bomb in Hiroshima, which all Americans should read to appreciate the truly horrific nature of our Nation's twin nuclear attacks on Japan. And finally, I have made the acquaintance of TToria, my favorite fun Brit book blogger, who has been really helpful in promoting both of my current stories, "Happily Ever After" (FREE 'til Friday here for UK Kindle readers, and here for US Kindle readers) and "Seven Lives to Repay Our Country" 99 cents on Kindle in the US, or £0.86 for the Kindle in the UK. Thus, for those on the fence about whether to hop, or not to hop, my advice is to emulate frogs, bunnies, and kangaroos everywhere. Thank you, Edward! I bought your short story today! I'm glad to have found your blog as well. Happy New Year to you! Hello, Edward. 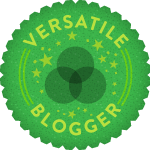 I've come by to return the favor and follow your blog. 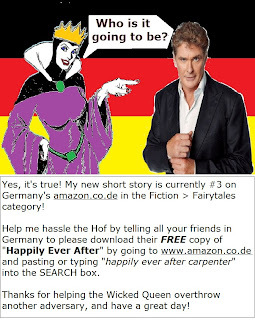 I just finished reviewing "Happily Ever After" for U.S. Amazon. Good stuff! You should tackle Narnia from the White Witch's perspective next. @Erin, I'm really happy you enjoyed the story, and I will take your suggestion re: Narnia under advisement! Thanks for the great review on Amazon, I really appreciate you taking the time to put that up. Hi Edward! It's me, Carole. I was hopping on by. I'll be sure to check out both 'Happily Ever After' and 'Seven Lives to Repay Our Country'. Carole, thanks for stopping by, and I hope you enjoy both stories... They're quite a bit different, so I'd be curious to hear your thoughts on trans-genre'd authors after you've read them both... Are a diverse array of works good from a reader's perspective, or troubling in that you don't know what to expect? Sharon, thanks a million for putting those out there!